It’s the last day of August, which means tomorrow is September and to me that means Fall! Yes it’s my favorite season and I have no apologies for my love of Autumn. I love the cooler air, warm drinks, cozy clothes and the quiet mornings once my kids head off to school. 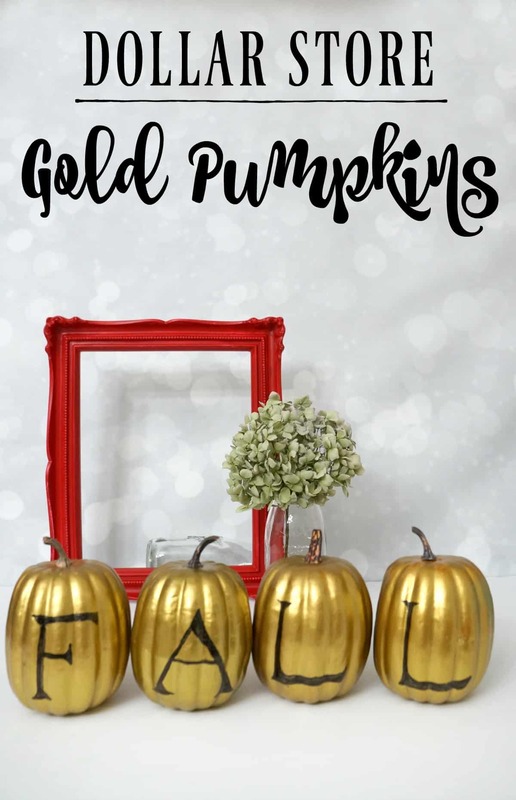 Today I am sharing a simple Fall project with supplies from the Dollar Store, I made these gold pumpkins using just a few items without any special tools. Read on to see how you can spruce up a few Dollar Store finds for the season. 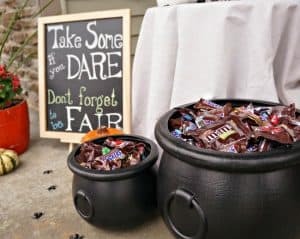 My friends in the My Dollar Store DIY group are all sharing Fall projects today, so be sure to check out theirs and be inspired. You can find links to their projects at the end of this post. This is what I started with. 4 orangey colored foam pumpkins. I liked their size and shape but the color was not doing it for me. 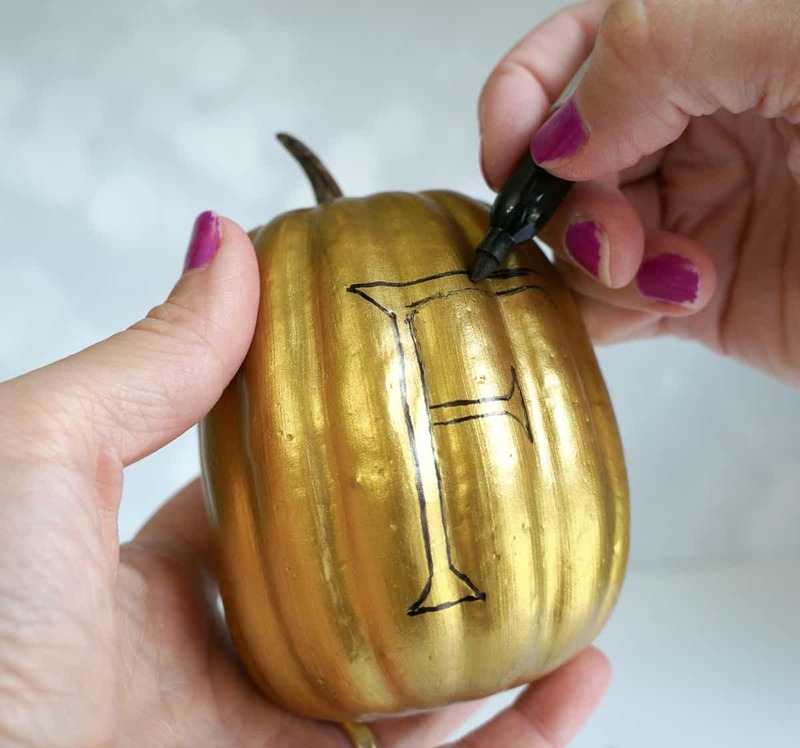 Once I got them home I was inspired to give them a touch of glam with gold metallic paint. I used Americana Decor Metallics in Vintage Brass to give them all a cohesive look. Once coat of this paint perfectly covered all the orange. I pondered my gold pumpkins for a while. 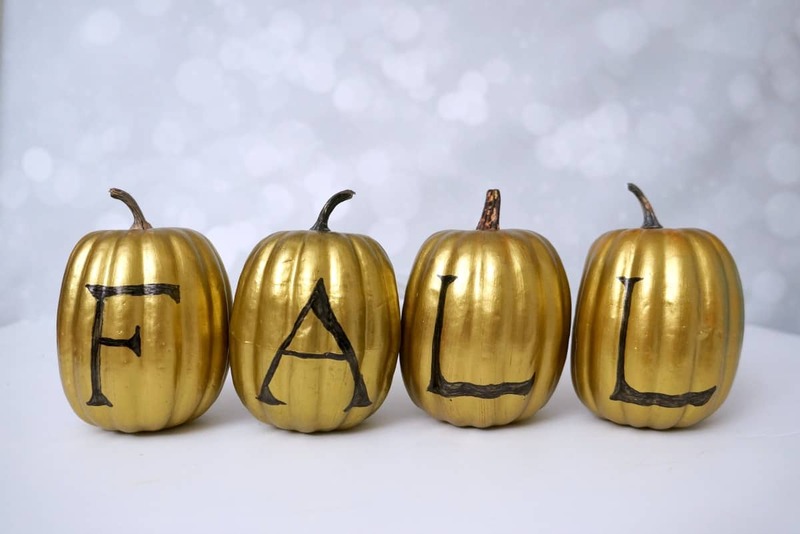 I thought about using vinyl or sticker letters to add the word Fall, I thought about creating stencils with my Silhouette to paint them too. Ultimately I grabbed a Sharpie and just started drawing. I have to pause here and tell you the only time I paint my nails is when I do a TV segment. I think it looks nice when they zoom in on my hands. But honestly, nail polish has no place on a crafter’s hands. This was a day after my segment and my nails were already chipped and covered in paint. Back to the project. I free handed these letters and no they don’t look perfect but they are not too shabby. The pumpkins have bumps so a sticker would not have adhered well any way. I am pretty proud of my freehand here. 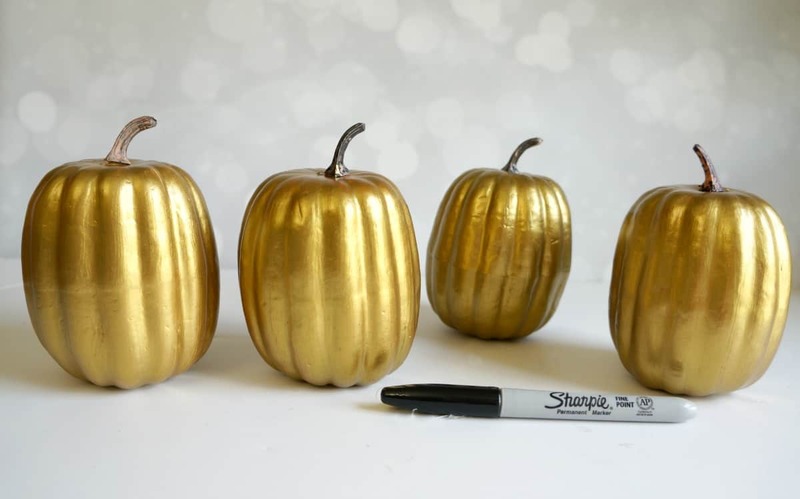 That’s all it took to create these Gold pumpkins from a Dollar Store find. I am excited to add some gold and metallic colors to my home for Fall, and I will be adding it soon. Once September rolls around I am in full Fall mode, no matter what the weather is. 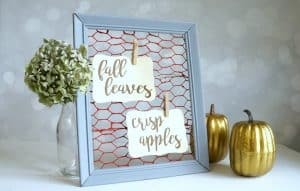 Now take a look at, and be inspired by, these beautiful Fall Dollar Store Projects. I love your new take on pumpkins! The gold paint is quite stunning! No worries about your nails, mine are the same, the trait of a true crafter! 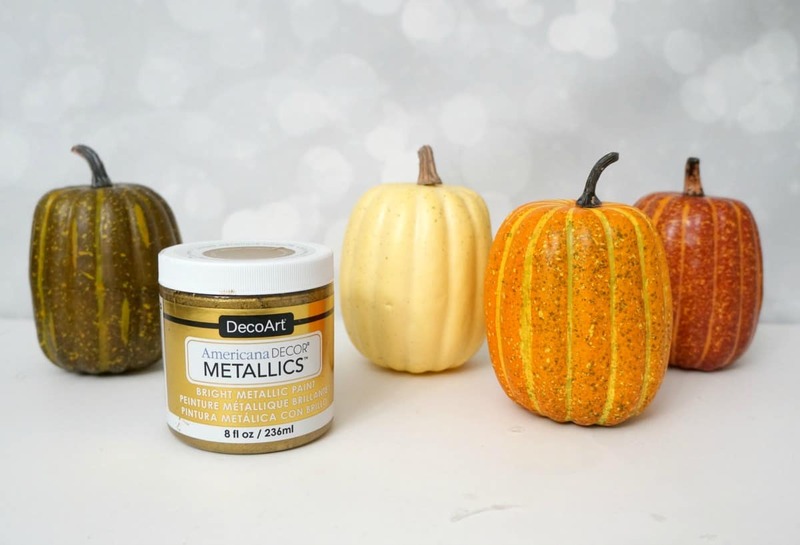 Loving your transformation of dollar store pumpkins into gold pumpkins! !